Nutrition textbooks will tell you need to eat your fruits, vegetables, whole grains, proteins, etc…, but textbook education does not teach children the essential lessons of living healthy and eating well. There is something powerful and life changing when children are given hands on education that is fun and applicable to their lives. To illustrate this point, a coach does not teach athletes how to perform by means of a textbook and chalkboard. There is some of that, but the real essence of learning comes when athletes practice and perfect their sport, working together as a team. The same principle should be used to teach children about health and nutrition. Most kids today do not know where food comes from, how to cook, live well and eat healthy. The modern American food landscape is flooded with meaningless labels such as “low-fat” and “low carb” – essentially jargon that the processed food industry uses to market unhealthy products. If it has a label, it is a “warning label.” We know that “a calorie is not a “calorie,” and macronutrient ratios and “energy balance” issues are not at the heart of the problem. Marketing schemes and conflicting opinions that distort the meaning of good nutrition, and consumers are flooded with misinformation which limits the ability to live well and eat healthy. Unfortunately, many processed foods contain excessive amounts of sugar and unhealthy “food additives” that sabotage satiety signals and taste buds, which causes millions of people to be addicted to foods that create metabolic dysfunction and chronic disease. It is becoming a mind boggling task to maneuver through the deceptions of food marketing and what it means to eat well. So what would be the best way to teach students nutrition in the right context and still fulfill the standards of the Common Core? …Cooking! 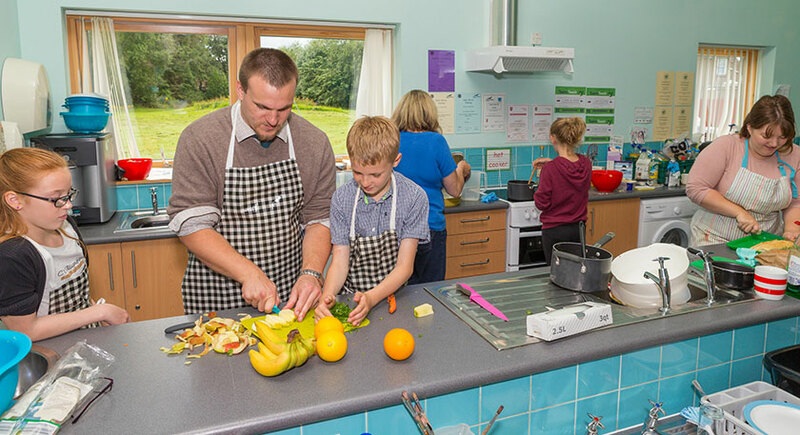 Cooking provides a medium for nutrition education, knowledge of where food comes from (and should not come from), skills to prepare wholesome meals, and trains the palate to crave healthy foods. But, how do we bring the kitchen to the classroom? It is time to modernize school kitchens, says Chef Ann, with the Chef Ann Foundation. Cindy Gershen, a successful chef and restaurant owner, founded the Wellness City Challenge and has created a very effective program for teaching nutrition and cooking at Mt. Diablo High School. In the program, Sustainable Hospitality & Tourism, students cook nutritious meals for the faculty and themselves for breakfast and lunch. Gershen sees dramatic changes in her kids, “they become advocates of healthy eating.” The Mt. Diablo students have even gone to the nation’s capital to present their project—Pathways to Healthy Living, a nutrition curriculum designed to promote change in the way Americans eat. Gershen’s program eliminates sugary processed foods and provides only wholesome fresh foods to train the student’s palate to crave what is healthy and nutritious for their body. Nutrition and cooking education empowers individuals, and gives them the freedom to live healthy. Gershen’s program is not about dieting, but simply living well; living well in such a way that it benefits of the environment, community, and individual. Stephen Ritz, a teacher in Bronx, New York, provides another exceptional testimony of how fun and hands on nutrition education not only gives the kids knowledge, but changes their lives. Ritz started the Green Bronx Machine as an after-school program for high school students, which has evolved into K-12+ model that is fully integrated into the core curriculum. The Green Bronx Machine has had amazing success with kids learning lifelong skills of growing sustainable gardens and kids enjoying healthy community grown foods. The Green Bronx machine has just launched the National Wellness Center, which includes a mobile kitchen made by Stephenson Custom Case equipped with sinks, cabinets, refrigerator, and the essentials of a normal kitchen. The National Wellness Center seeks to give students the resources, education and tools they need to become healthy themselves and then to expand their skills knowledge and abilities among their family and communities. The kids learn to apply their nutrition knowledge and cooking skills to everyday life when teachers use the mobile kitchen or a kitchen classroom. This hands-on dynamic education is fun and inspires the students to want to learn more and apply their knowledge. Together, knowledge and skills equip these students to change the standard American diet (or SAD diet) in their family and community. These are just a few examples of efforts in the U.S. to teach nutrition in the context of cooking with real food. Stay tuned for more features on model solutions for teaching nutrition. Author and Nutrition Ambassador: Alexandria Van Zandt graduated from UC Davis with a BS in clinical nutrition. She is passionate about nutrition physiology and wants to find better ways to personalize nutrition based on the individual’s needs.